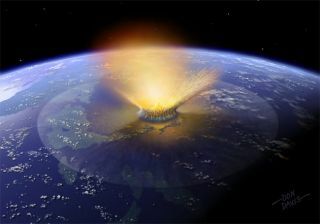 Researchers speculate a giant fragment produced by a collision between two asteroids smashed into Earth 65 million years ago, creating the Chicxulub crater off the coast of the Yucatan. SAN FRANCISCO ? If a big asteroid were streaking toward Earth and time were running out, a well-placed nuclear explosion could help humanity avert catastrophe ? and not just in the movies. A new study has injected new life into the old idea of dealing with a potentially threatening space rock by nuking it. The new analysis suggests that a nuclear blast could safely destroy even a relatively large asteroid. And astronauts wouldn't need to bore deep into the space rock, ? la Bruce Willis and his crew in the movie "Armageddon," to implant the bomb. An explosion on the asteroid's surface would likely do the trick, scientists report. "It would be blown to smithereens," said study lead author Bob Weaver of Los Alamos National Laboratory in New Mexico, who presented the findings here Dec. 13 at the fall meeting of the American Geophysical Union. People have talked for decades about the possibility of using a nuclear device to blow apart a potentially dangerous asteroid. But these discussions typically didn?t progress much beyond numerical arm-waving, Weaver said. "There was a lot of back-of-the-envelope stuff," he told SPACE.com. By contrast, Weaver said, he and his colleagues developed sophisticated codes to model exactly what would happen in such an explosion. In previous studies, the researchers had modeled how a nuke would affect a solid asteroid about 1,650 feet (500 meters) long and with a shape based on a known oblong space rock called Itokawa. That work found that a nuke could blast the asteroid into pieces too small to pose much danger. And the explosion would send these pieces flying apart at tremendous speeds ? fast enough that they would not re-aggregrate to threaten the Earth again. "That was extremely encouraging," Weaver said. However, the team's older models assumed a solid chunk of rock ? no longer a very realistic expectation. "We know asteroids are porous," Weaver said. "Many of them are basically rubble piles." The researchers exploded the nuke on the space rock's surface, as in previous models. And once again, the asteroid was blown to tiny, harmless bits that spread outward too quickly to be drawn back together. The best results were achieved by positioning the explosive on the asteroid's short side, Weaver said, but any orientation they tried did the job. "These calculations show that, even with a very porous object, a nuclear explosion can probably mitigate a potentially hazardous object," Weaver said. Humanity probably has the technological capability to pull off an asteroid-destroying mission right now, Weaver said. The tougher obstacle might be getting the international community to cooperate enough to organize such a strike. With nukes involved, working together might be difficult, he said. "The social and political implications of how to carry out this mission are actually much tougher than the science," Weaver said. While some people may find the prospect of using nuclear bombs unpalatable even to blast apart asteroids, conventional explosives just couldn't deliver, Weaver said ? at least not for a space rock as big as the one in the team's models. "They're not even close," he said of conventional bombs. "They're orders of magnitude away from being powerful enough." Anyway, it would be nice to have the nuclear option, according to Weaver, because the future is uncertain. In the past, massive impacts have wreaked havoc upon the Earth. A strike 65 million years ago, for example, is thought to have finished off the dinosaurs and many other species. "This is something we'd like to have in our back pocket, just in case we need it," Weaver said. Will an Asteroid Hit Earth? Are We All Doomed?